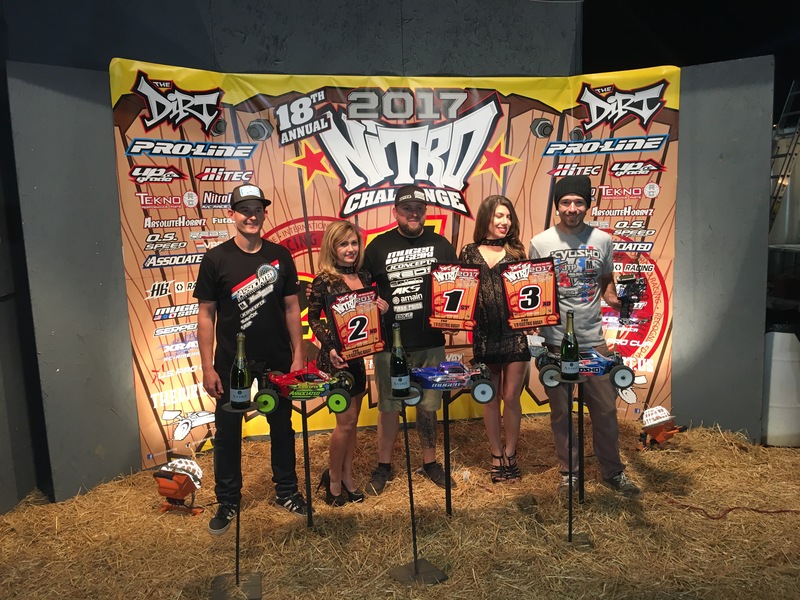 First nitro race of the season is The Dirt Nitro Challenge in AZ. This race used to be in Hemet California and I have been to every event since 2000, so this race has a long history and I was excited for the 2017 version. I was just out here at the Fear Farm track a week and a half ago doing some practicing and testing, but now there was a new track layout. Some of the pro drivers were out here and we were talking to Joey C, the man behind The Dirt, and we were talking about past track designs. For 2017, Joey went all out and built a bit of a replica track, but the weather did quite work out super well. A lot of rain the weekend before the event left the track in rough shape and the track would turn out to be one of the most challenging tracks of all time. I flew in Tuesday evening and would get all ready for the event starting Wednesday morning. Practice would start right at 8am Wednesday and we would have two rounds, 6 minute practice runs, and 57 heats in each round. The first would be an open practice, not timed, and the second would be timed and used for seeding. Take your best three consecutive laps and set the heats up slowest drivers first, fastest drivers last. Wednesday was here and I was the birthday boy …. turning 30! The track would start out pretty rough, but would break in pretty nice by the time my first practice was up in heat 16. Ebuggy was up first, followed by Nitro Truggy, and then Nitro Buggy being the last class. I would start out practice with AKA Soft Impacts on all three cars just to get the feel of the track. The track was pretty challenging with the not so smooth conditions and two very tough jump sections. One being the step up in the middle, with no time to test jump anything before practice with all the weather they had, the jump just didn’t have enough lip to get you over the top and have you land on the downside. You would have to hit the lip fast and just clear the top, but launch all the way over the landing and deep into the turn. The next difficult section is the front triple, triple, triple. This section is the lowest spot on the track and held the most water, so now it was the roughest. The turn was super choppy and sticky, and the jumps were sticky and rough as well, it would cause havoc all day and all weekend. I felt pretty good on the track and all three cars were working pretty good. I felt like I had the track down pretty good and had a good grasp on my cars, the track was also coming around and getting better with each heat running. I got my cars ready for seeding and just waited. Ebuggy was the first class for me, and it didn’t go as planned. Right from the start something seemed wrong, the car had no power and no brakes, I wasn’t sure what was wrong. I got back to the pit lane and Joe Pillars pulled the body to check it out. We only get 6 minutes and with laps in the 43 second range, you didn’t get many chances at three consecutive laps. Everything looked fine, so I checked my radio … my brake and throttle EPA’s were both low, around 40% and my sub trim was off from zero. I started to adjust everything and then it clicked … I was on the wrong car model!!! I thought I was gonna get smarter when I turned 30 😦 I missed two laps and then got back out there, but I was out of rhythm and frustrated. I couldn’t put three laps together and crashed many times, seeding 13th. I couldn’t believe that I made such a silly mistake, but I put it behind me and got ready for Truggy. 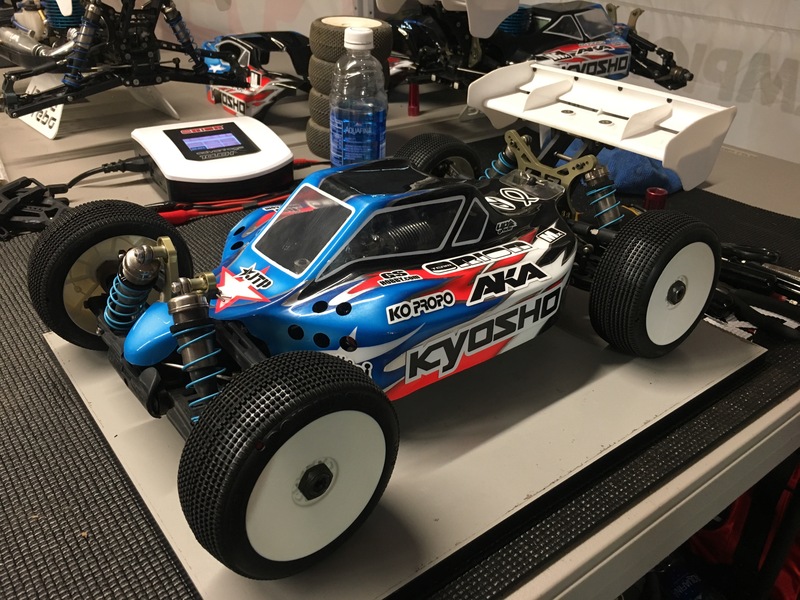 Putting on AKA Soft Gridiron2’s on my Kyosho STRR, my truggy was feeling good. I had a pretty good practice session, but was just a little off for the fast lap times, I seeded 7th. The water system also broke early in practice, so most of the day the track was ran dry and that is not normal for The Dirt. With the rough starting point for the track and the dry conditions, the track was already starting to get hard packed and even blue grooved in some spots. After the sun went down they got the watering system working some and decided to add a little water here and there. The track also getting better and the loose top was all off and the racing line was getting pretty clean. For Nitro Buggy I decided to run AKA Super Soft DoubleDown’s. My seeding would start at 12:40am … so it was a super long day. 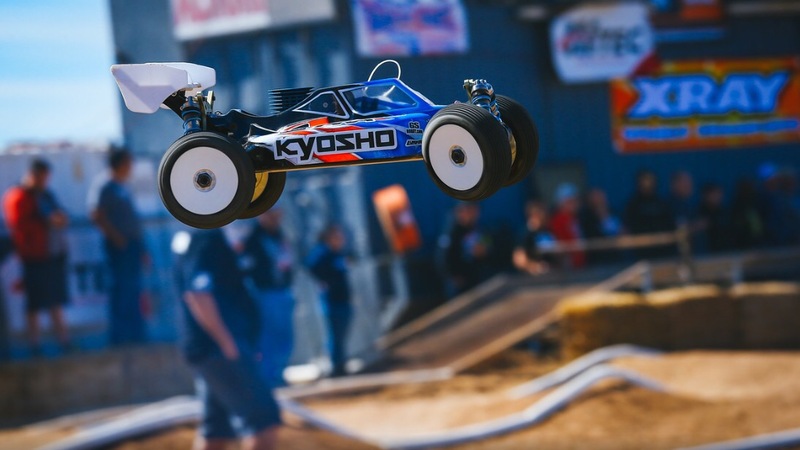 My Kyosho MP9 TKI4 was working great and I had a good run, seeding 3rd. 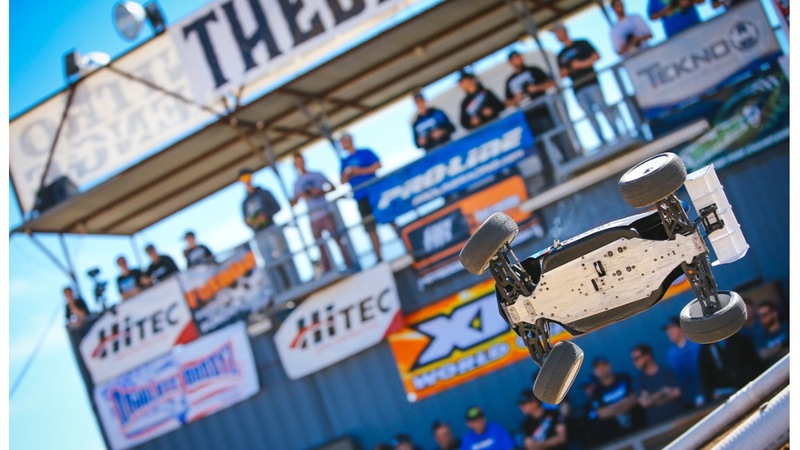 Thursday was here and it was finally an official qualifying day for Truggy and Electric Buggy. 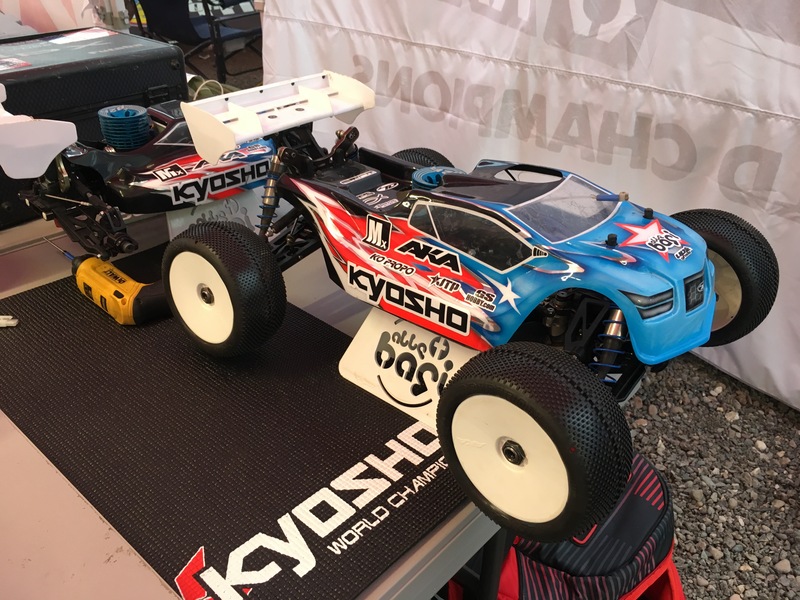 Making no changes to my Kyosho MP9e TKI4 and running the same AKA Super Soft DoubleDown from last night I was ready. I would have a pretty good run, fairly consistent for the very difficult conditions, and I would get 4th for Q1. Truggy would be pretty similar and I would finish with 6th for Q1. I was pretty happy with eBuggy as I seemed a little closer to the pace that I needed to be at, but Truggy I was a little more off. For Q2 I would make no changes to my eBuggy and run the same tires. I had a similar run, but I ran up front for some in the beginning before making a costly mistake. Again I would finish 4th. For Truggy I would make quite a few setup changes for Q2. I had too many mistakes and finished 9th. For Q3 in eBuggy I wanted to try a different tire and went for a gamble with AKA Super Soft Typo’s. That tire had success in the past at this track, and I also did some testing with it two weeks ago when I was at Fear Farm. Unfortunately I would come into the front triple, triple, triple on my first lap of warm up and there would be a crashed car. I checked up some as I saw it late and just nosed into the second triple landing, exploding my front end and ending my qualifier before it even started. Q3 of Truggy I again made some major setup changes. This time I seemed to have my best speed as I lead the first couple laps and then ran just behind the leader for a while. I cased the first triple though and went upside down, losing a ton of time and finishing 11th for the round. Friday would be a long day with just Nitro Buggy qualifying. I was really looking forward to qualifying starting as I wanted to do better yesterday and I seeded the best with my nitro Buggy. The track was still changing a ton and they were not putting any water down like normal. The track was getting blue groove, but also very polished and slick. For Q1 I ran my car exactly like I did in seeding and went with AKA Long Wear Super Soft DoubleDown’s. My car was very edgy and very difficult to drive, and I made a ton of mistakes early and had a pretty rough run, finishing 16th in Q1. Q2 I would make quite a few front end changes, diff oil changes, and a tire change, going to AKA Soft DoubleDown. I would have much better pace and run up front early, but couldn’t stay clean and would crash and get 9th for Q2. I was feeling much happier, but my car was still very hard to drive. Earlier in the day, my main pitman, Joe Pillars got some bad news from home. His wife was having some health issues and it would be best for him to go back home. Right after Q2 finished I took him back to the hotel and he was headed back home to be there for his family. For Q3 I would make my rear end softer with shock oil and sway bar, and again change tires to AKA Super Soft Impacts. I was trying to gain traction to get my car easier to drive. Again I had a tough qualifier and I just felt very uncomfortable on the track. I crashed many times and finished 11th for Q3. I would end up 13th, the first position to miss the A-Main and I would start 1st in the B-Main on Sunday. One side I was really bummed as I haven’t been in a nitro b-main in a very long time, but on the other side I was happy. I obviously needed more track time and I thought racing the b-main would be good for me. Saturday was the Main day for eBuggy and Truggy. Around 1pm we had our A-Main practice sessions. I wanted to try the Typo’s again in ebuggy so that’s what I started on. The practice was during the sunny part of the day and our A-Main would be later in the evening, so the track would be different. The Typo’s felt too soft and not that great, so I switched to AKA Super Soft DoubleDown and was feeling much better. I was just trying to focus on clean laps and not making mistakes, that was going to be KEY for the rest of the event. Truggy practice went good as well and I was mentally ready for the mains. I also had some new pit help as Joe Pillars went home. 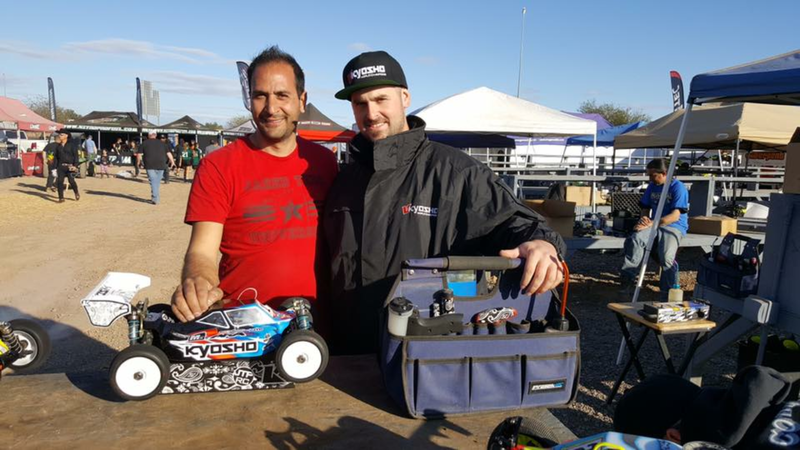 Some great Kyosho teammates, Ofir Komerian from Jersey, and Ben Sterling from Australia stepped in and helped. We did two practice stops in the warm up …. all was feeling good. 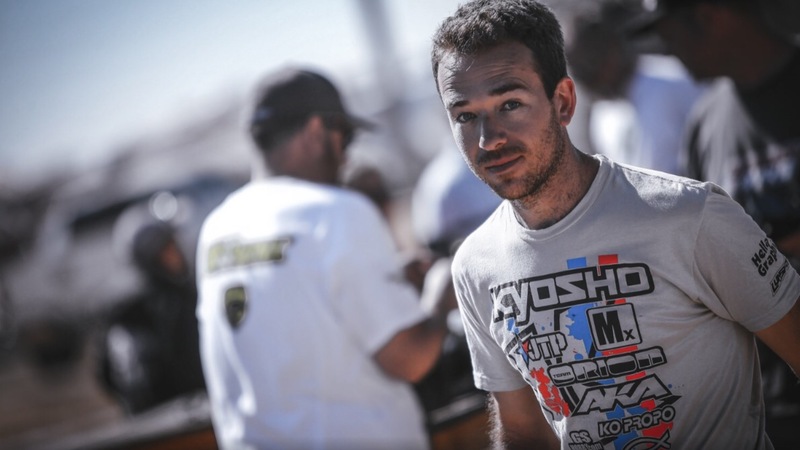 eBuggy A-Main : I started 5th and I was thinking the 10 minute main was going to be very intense and just crazy. My goal was to drive aggressive early and try to miss all the crashed cars that would be in front of me. My start was good and I made the first few laps clean, moving up one position I think. You could easily lose or gain multiple seconds on this track, so positions were changing all the time. Before the halfway point I had moved into second and was feeling very confident with my car and driving. I was only a few seconds behind Maifield who was leading, but it was hard to try to push at all to catch anyone. I got a little out of my flow and flipped in a couple turns and then hit a loose rock in a short straight after the step up. My car went left and I tried to correct, but I smacked the pipe and went flipping. I dropped from 2nd to 6th I think, but there was huge pack battling. I got back into the flow and even started to hit the final triple in the front triple, triple, triple section. On the last lap I had moved into 4th, hit the last triple, and closed onto the battle for 2nd. Ty Tessman then bobbled in the whoop section and I moved into 3rd, but the battle was still on. We both hit the triple going onto the back straight, I landed a little hard and had to check up, Tessman didn’t check up and tried going inside, but there was no room. We hit and it spun me around, but he did the right thing and let me go back around him and the battle continued. I cleared the step up and finished 3rd! I was really happy with my car and my driving, felt great to get the podium finish. Maifield won and Cavalieri finished 2nd. 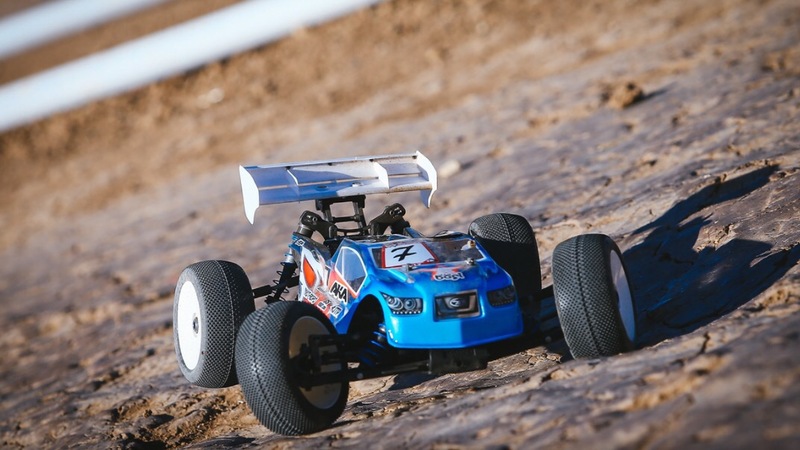 Truggy A-main : Starting 7th I knew this main could be very similar to the eBuggy main with many position changes. I needed to stay as clean as possible early and get up front and give myself a shot to win. My start was pretty good and I stayed right in the 5th-6th position for the first half. It seemed like me and Ryan Cavalieri were battling for most of the main and we were matching each others pace, but also matching mistakes. 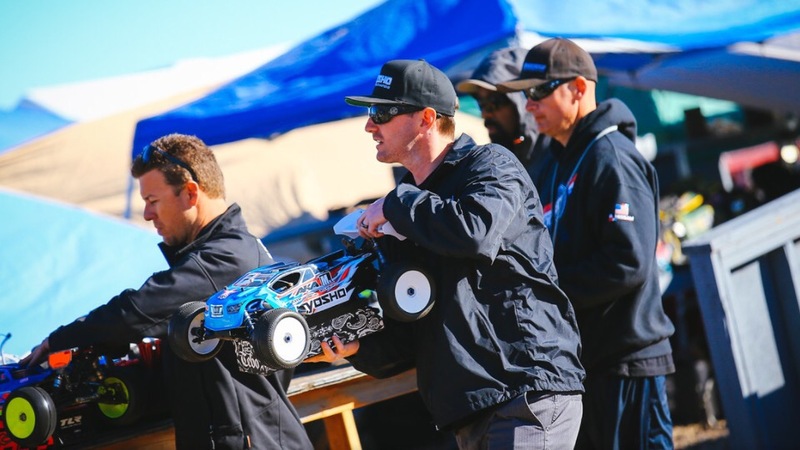 The top 4 were pulling away from us, until the leader at the time, Ty Tessman had his truck stick full throttle and fly off the track, and then shortly after that, 3rd place Ryan Lutz had a servo issue. Our battle turned from battling for 5th, to battling for 3rd. I moved into 3rd and was 16 seconds back from 2nd, Joe Bornhorst. We both got into our groove again and started chipping away and driving much cleaner. With about 10 minutes to go, I was running 3rd and only 4 seconds back from 2nd, we had been catching him slowly but surely. I then made a costly mistake going under the bridge. I got onto the throttle too early in the 180 before the bridge, that put me too far to the left going under, then I was too far outside and the corner was much sharper with my bad angle. I turned too hard and went over, and it cost me a TON of time, losing 3rd and dropping about 5 seconds back. I had an amazing last pit stop to gain a second or two and drove the final stint of the race clean, catching up to Cavalieri on the last lap, but I finished .9 back and missed the podium. Maifield again took the win, Bornhorst 2nd, and Cav 3rd. I was happy with my driving in the 45 minute main, but a little bummed to be so close to the podium and miss it. Sunday Sunday Sunday!!! Normally I would be prepping for the A-Main warm up and then getting ready for the main after that. Today I was in the B-Main, but I was excited. In my head, I was struggling with my car setup, struggling with my driving, and struggling with the track last time I drove my nitro buggy on Friday. 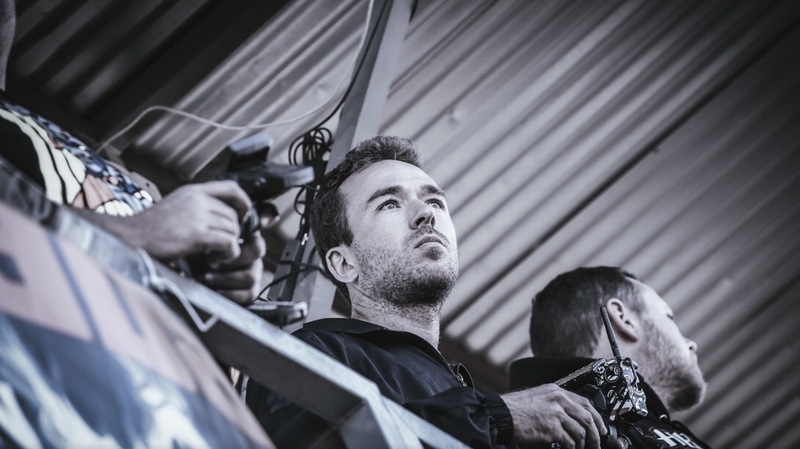 Saturday I had a big improvement and battled for podiums in both my mains and finished 3rd in eBuggy. 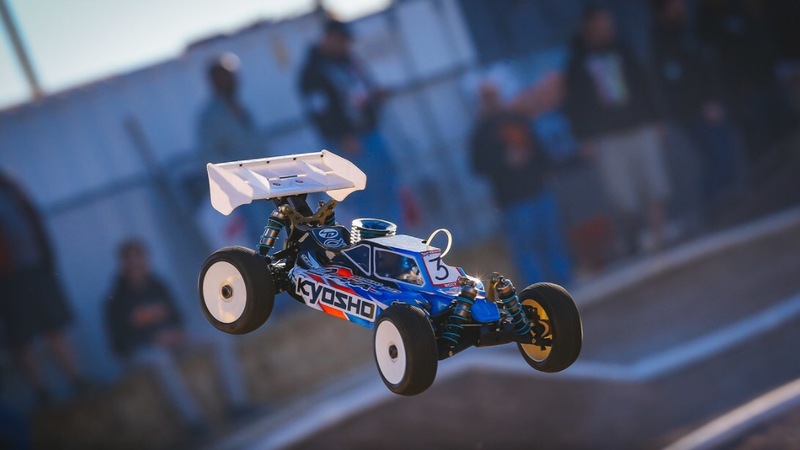 I took what I learned from my eBuggy and made some setup changes to my Kyosho MP9 TKI4. I also decided to go back to the AKA DoubleDown tire, which I thought worked perfect in my eBuggy main. I watched the lower Pro Buggy mains before me and watched the Pro Buggy warm up, and I saw some good lines and saw the bad lines. My plan was to get a good start in the B-Main and gain some confidence. I wasn’t feeling nervous at all. I figured if I struggled in the B-Main and didn’t bump, I would have struggled in the A-Main and had no shot a podium, so it wouldn’t have really mattered anyways. My car was prepped good and I knew it could finish the 30 minute B-Main and the 45 minute A-Main with no issues … as long as I didn’t do any crazy hits in the front triple, triple, triple. I started 1st …. I was revving my engine and then we went down and quiet …. somebody just went behind me, I didn’t hear any tone or anything, so I had the pack all over me. Thankfully Cody King drove me super nice and respectful into the first turn, but he didn’t get so lucky as he got hit going off the bridge. My heart rate was a little high right off the start, but I busted out some clean laps and built a lead early. The race was going just the way I wanted and 4 or 5 laps in and I had built a 5 second lead. Then in one lap I got a little on edge in a few turns, and then got super wild in the turn before the front triple’s, and I cased the first triple … front flipped … bounced off the face of the second triple … got sideways and was up against the hay bales. Thankfully I practice along sometimes so I have the bounce technique down. I bounced my car off the hay bale and got turned around, but I was in the mouth of the beast now. Dropped from a safe lead to 5th and out of a transfer spot, as the top 3 finishers transfer to the A-Main. It was really hectic mid pack and drivers were cut throat fighting for their shot in the main. Again my heart rate was high and I was feeling nerves for the first time about being in this b-main, I was deep in battle and not in the top three positions. I took a deep breath, got back in my rhythm and started to work my way forward. It took me probably till the halfway point, 15 minutes in, to get back into 3rd, but then I shortly got into 2nd and went after the leader. Mike Truhe held the lead, I was second, and JQ had 3rd. I caught Mike and wasn’t forcing the issue at all, my plan was to just wait for a mistake and then take the lead. My plan worked and I got into the lead with 5 minutes to go or so, and cruised it home to take the B-Main win and start 13th in the A-Main. I was happy with the bump, but my car was still very hard to drive. I had some work to do. In the B-Main, the sun was shinning and temp was up, so I ran AKA Soft DoubleDown’s. For the A-Mains the track crew decided to start watering again and watered the track for each A-Main. The sun also went down, and so did the temp, this was playing right into my plan to run the 45 minute A-Main on AKA Super Soft DoubleDown’s. Starting 13th I knew the start could go good or bad. First lap I hit a car and flipped, dropping me back to 15th. I stayed in 15th for the first 5 laps or so and the lead pack was WAY ahead. I was hitting the front triples and the leader was hitting the triple to the back straight, I thought to myself …. dang it, this will be a long 45 minutes fighting in the back. I got into a good groove and started to make a bunch of passes and getting closer and closer to the front. After the first pit stop, Ronnefalk had some sort of issue, a very long pit stop. I also saw that some drivers in front of me were pitting before 9 minutes, so my mood changed and I had some great motivation. The lead pack was battling super hard and I was getting closer, moving into the top 5 after a few pit stops. Now I was in 3rd and 1st was only maybe 5 seconds ahead of me. Very similar to my A-Main during the IFMAR Worlds, I had one thing that happened that changed the whole rest of my main. I had just moved into 2nd and then Phend passed me back. Right after he passed me, he clipped the inside pipe on the back left roller, he flipped right in the middle of the track. I tried to miss him, but I ran right into him and went upside down. There was a huge pack of cars behind and my car just got blasted multiple times. I was the last car marshalled and went from starting the lap 2nd to finishing the lap in 8th and losing 10 or more seconds. I could not believe it and was so mad that had just happened, I just wanted to fly my car off the track I was so mad inside my head. It took a few minutes for me to calm down and get back into my groove. I slowly started to chip away and pass a couple of cars here and there, getting passed Rivkin to move into 5th. That is where I would stay and finish the main. Maifield took another win and did the first ever 3 class Pro sweep, major congrats to him! I am happy to have the event done and over, I am completely exhausted! Had a super up and down weekend, but I think I finished on a high. All the top drivers in the world were there, the track was hardest track I have ever driven on, qualifying was very rough. To finish 3rd, 4th, and 5th …. I’ll take that and move onto the next event. 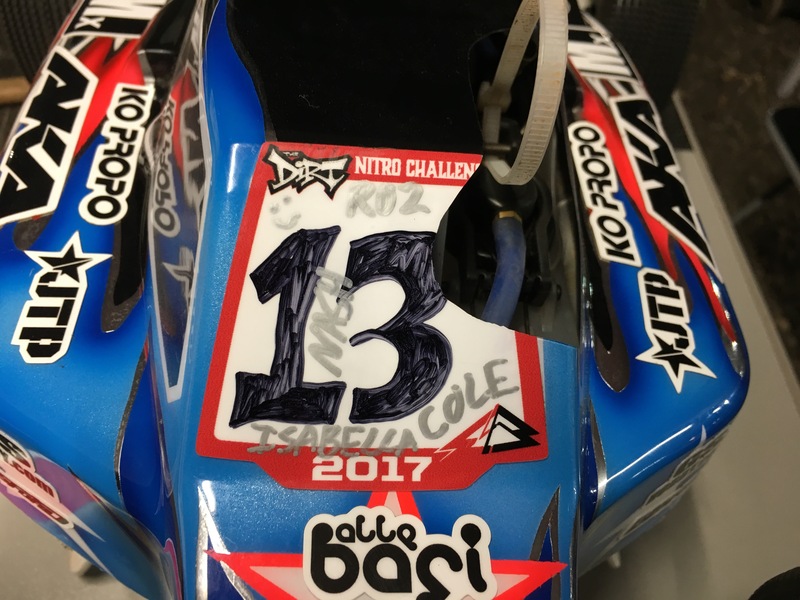 Thanks to Joe Pillars, Ofir Komerian, Ben Sterling, all my fans, my family, and all my great sponsors : Kyosho, MX, AKA, Team Orion, KO Propo, GS Hobby, JTP, Upgrade-RC, TD Paint, Lunsford and the Good Lord Jesus Christ!